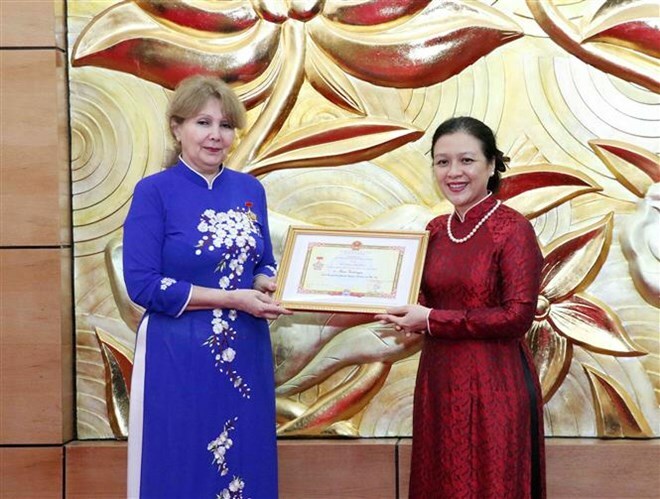 Hanoi (VNA) - Ambassador of Armenia to Vietnam Raisa Vardanyan was honoured on April 5 with the “For Peace and Friendship among Nations” insignia of the Vietnam Union of Friendship Organisations (VUFO). Presenting the insignia to the ambassador at a ceremony held in Hanoi, VUFO President Nguyen Phuong Nga spoke highly of Vardanyan’s efforts, as the first Armenian Ambassador to Vietnam, in bolstering the bilateral relations built on trust and mutual understanding. Nga added that the two countries’ cooperation has been deepened in various spheres, including economy, trade, science-technology, culture and people-to-people exchanges. The Armenian diplomat has paid due attention to and worked with the Vietnam-Armenia Friendship Association to organise external activities and celebrations of the countries’ major events, she added. For her part, Vardanyan thanked the VUFO and the Vietnam-Armenia Friendship Association for their support for the Embassy of Armenia in Vietnam to arrange activities which helped foster the traditional bilateral friendship and multifaceted cooperation, particularly people-to-people diplomacy.